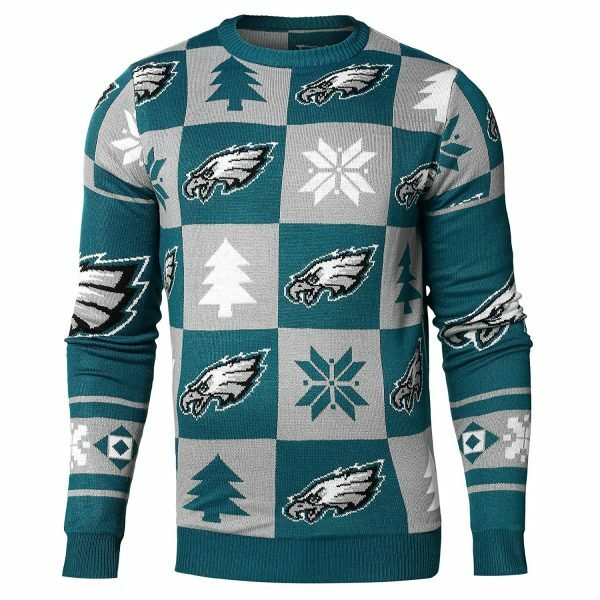 Nothing says loyalty like wearing your favorite NFL team’s ugly Christmas sweater while sitting down for your loved ones for a holiday dinner. 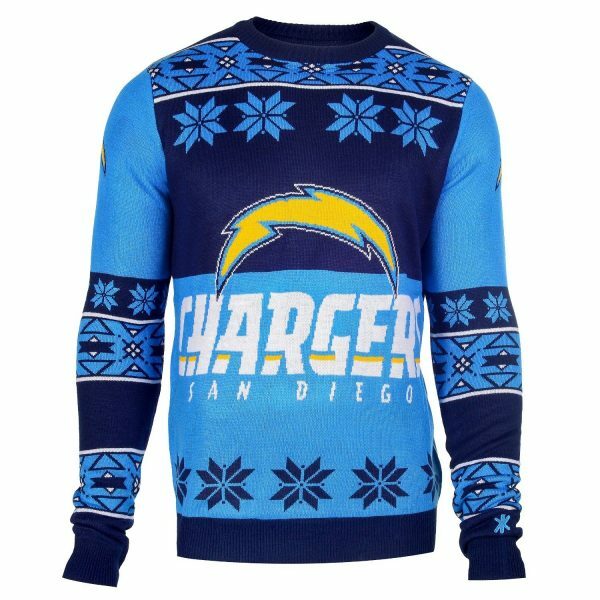 In 2016, the sweaters are uglier than ever. 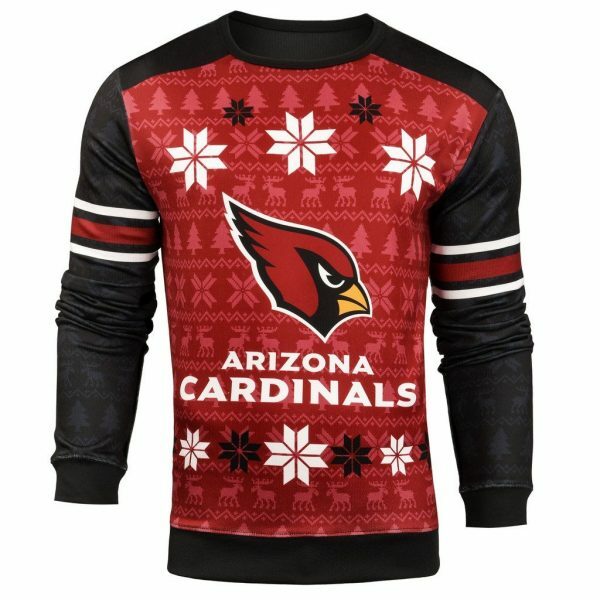 There are plenty of ugly Christmas sweaters out there for you to choose from, but NFL teams, especially the ones doing poorly, relate perfectly to a holiday with the family, which might also be a group of people you’re not that fond of or enjoy being with, but stick with them anyway. 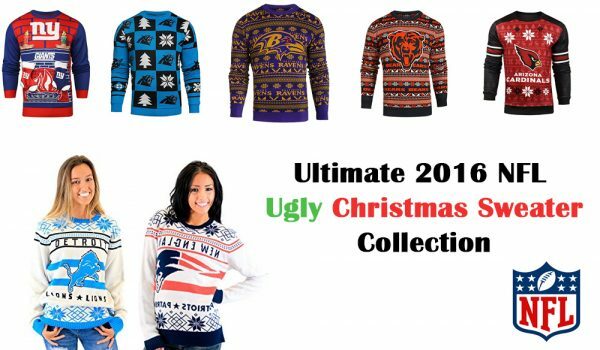 We’re here to recommend one new design for each of the 32 NFL teams, but feel free to browse the entire collection, including successful ugly Christmas sweaters from years gone by. Like with most designs (although this one is actually a bit better looking), you can find more teams with the same template. 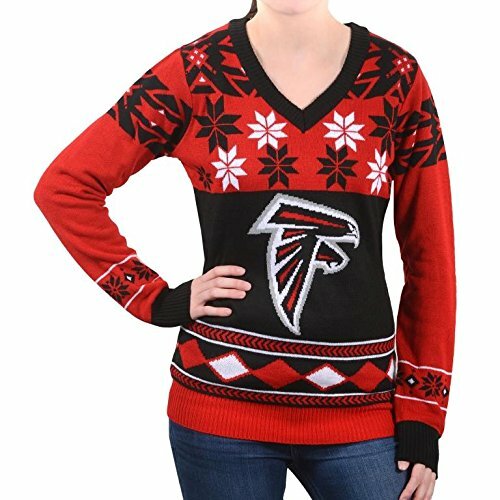 This specific v-neck Christmas sweater is for women, but there are plenty of men’s Falcons ugly christmas sweaters. 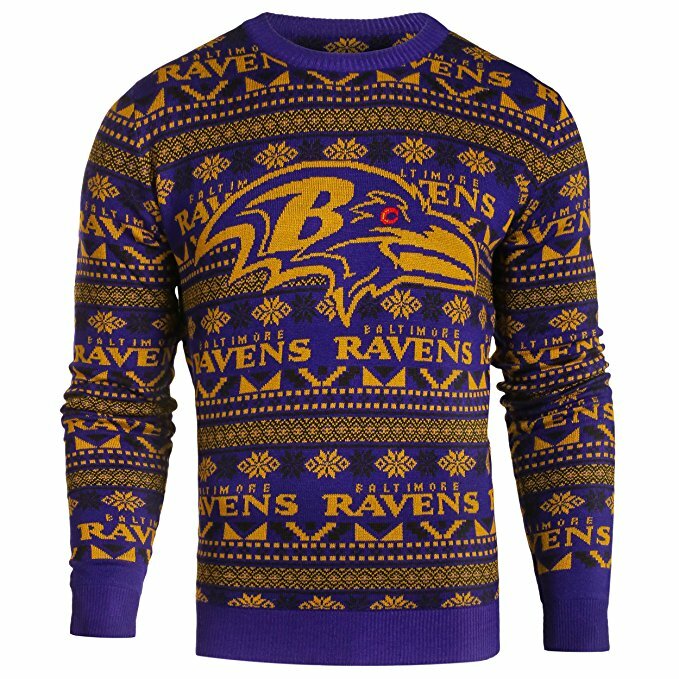 This Baltimore Ravens christmas sweater reminds me of some riddle a Indiana Jones-type person needs to solve before entering an ancient temple. Available on Amazon. 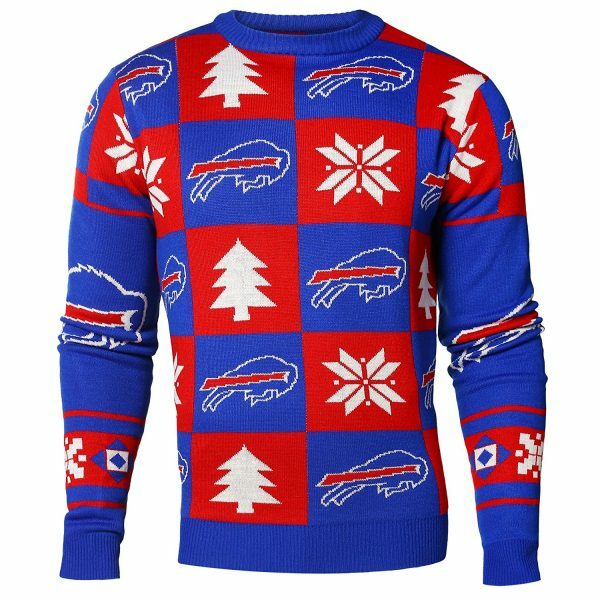 If there’s anywhere where a Christmas sweater will be put to good use, it’s Buffalo. 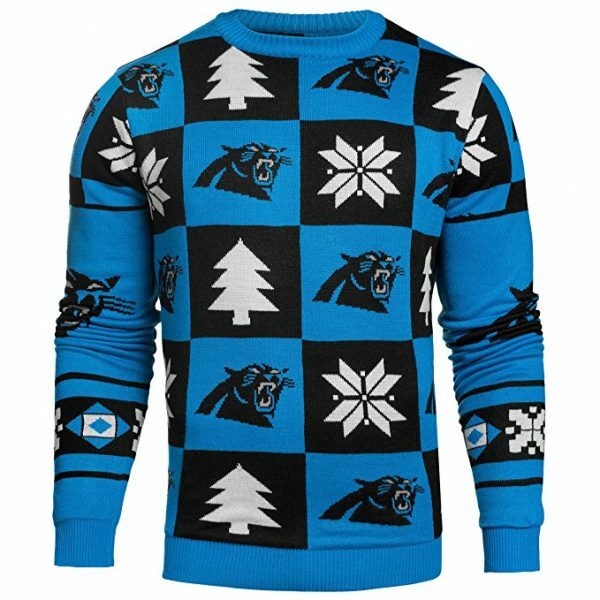 I’ve always had a strange sympathy for the Panthers, so here’s to their fans not being too gloomy while wearing this sweater on Christmas. 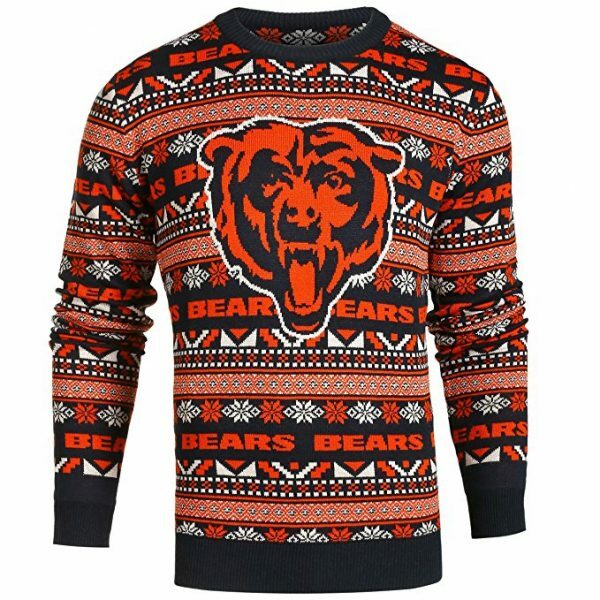 It gets really cold in Chicago, but the combination of this sweater and being angry at the Bears for sucking should do the trick. Looks a lot like the Bears sweater. The Bengals are almost as bad. 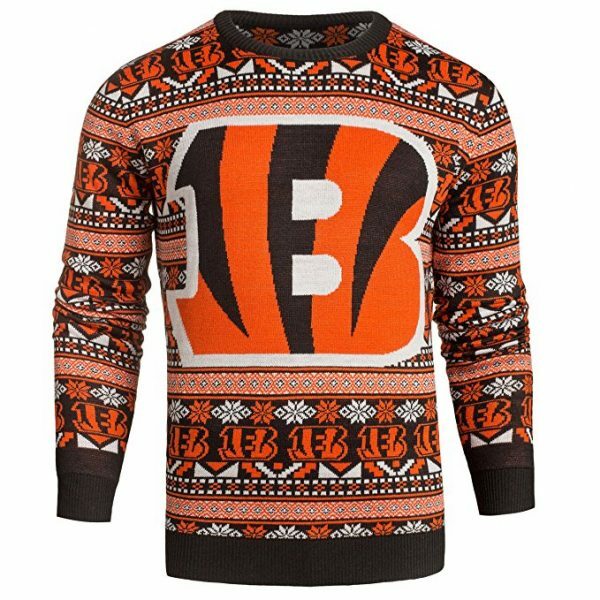 To buy the Cincinnati Bengals ugly christmas sweater. The Browns continue to prove the theory that sports fans are probably the most loyal creatures on the planet besides dogs. 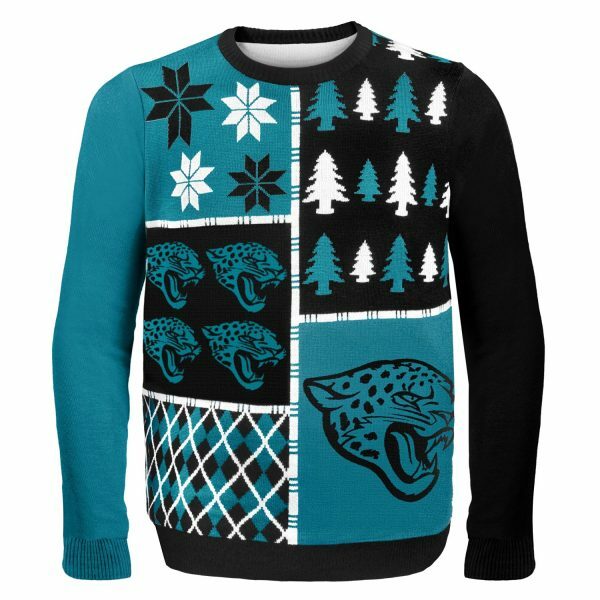 Buy this sweater to prove losing doesn’t matter. 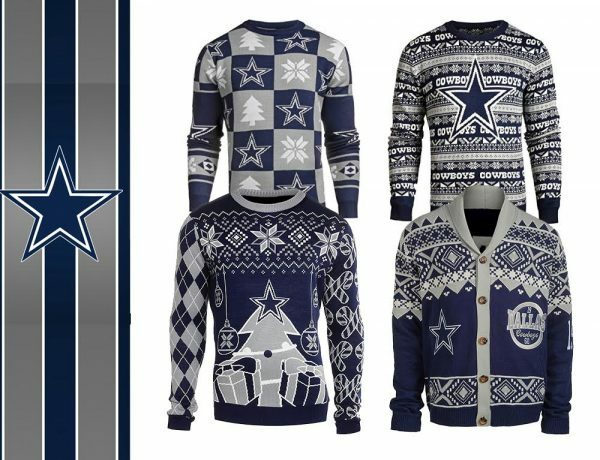 Unlike last season, it’s a lot easier to walk around with a Cowboys sweater and feel proud this season. The huge star makes it less classically ugly, but it still makes a perfect Christmas sweater. 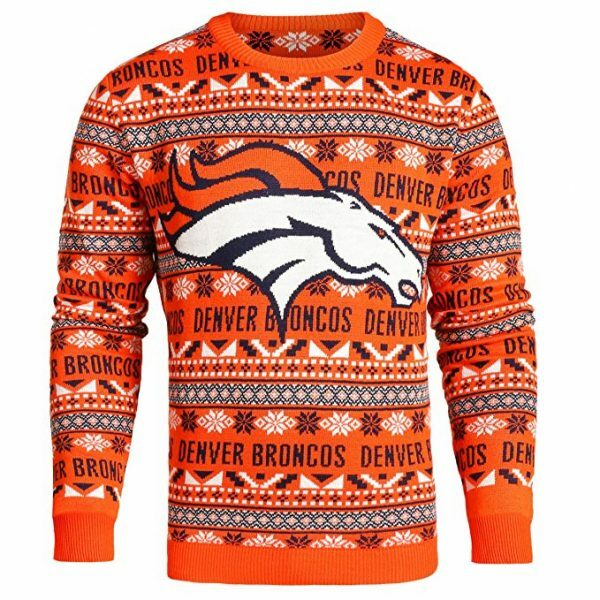 For obvious reasons, this Denver Broncos ugly christmas sweater makes me think of BoJack Horseman. Which is a good thing. 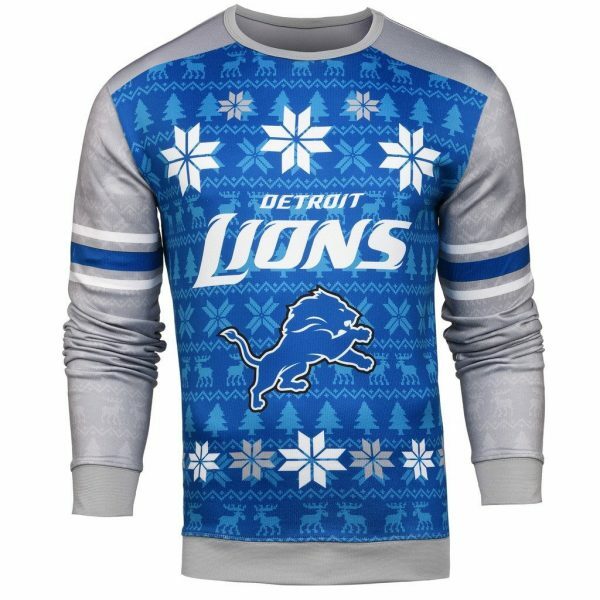 I’m not a Lions fan, but I love the silver-blue combination, which really fits snow and ice and cold. Maybe it’s because I’m a Silverhawks fanboy (the cartoon). 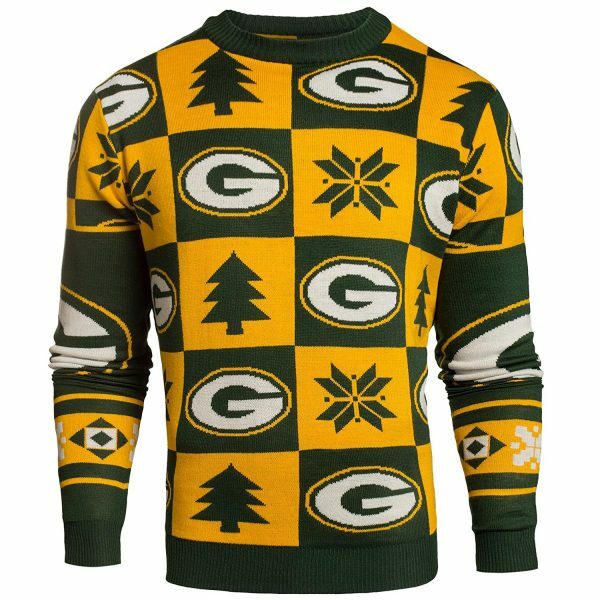 The crew neck patches ugly christmas sweater design is the most common among NFL fans, and there’s something that works well with the Packers colors and this design. 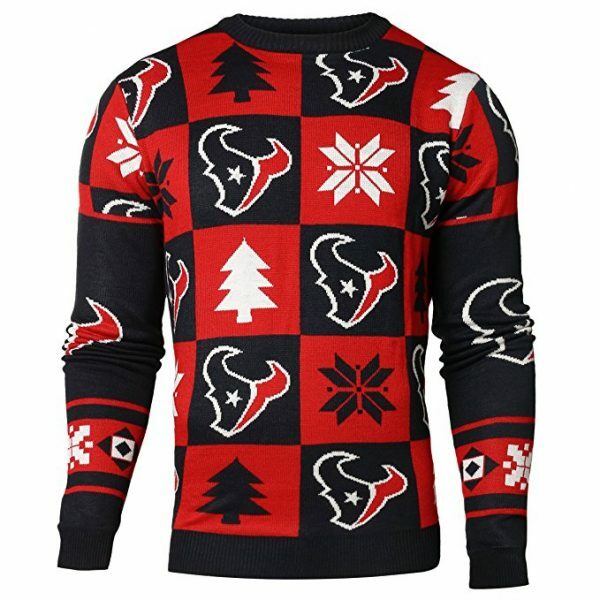 Something about the bull and the horns isn’t Xmassy, but as far as color combinations, the Texans have one of the best ugly christmas sweaters. 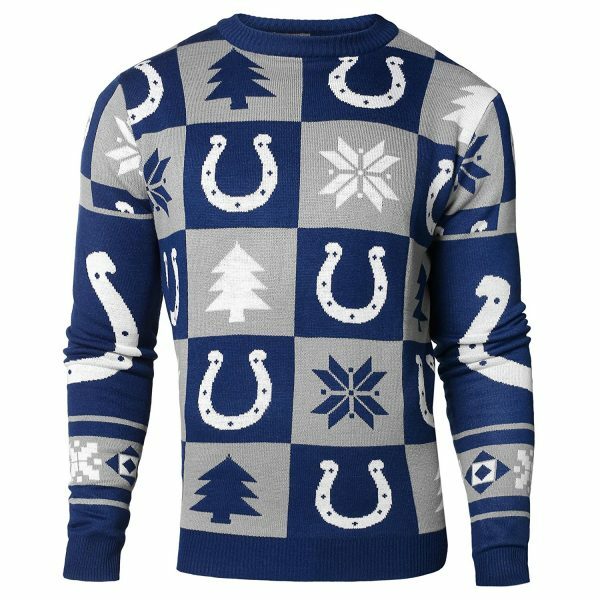 Like other blue-gray-white color schemes, the Indianapolis Colts ugly christmas sweater design is perfect for the holiday season. Jaguars and Jacksonville isn’t exactly a winter combination. So what? It’s a cool sweater, as ugly as the rest of ’em. 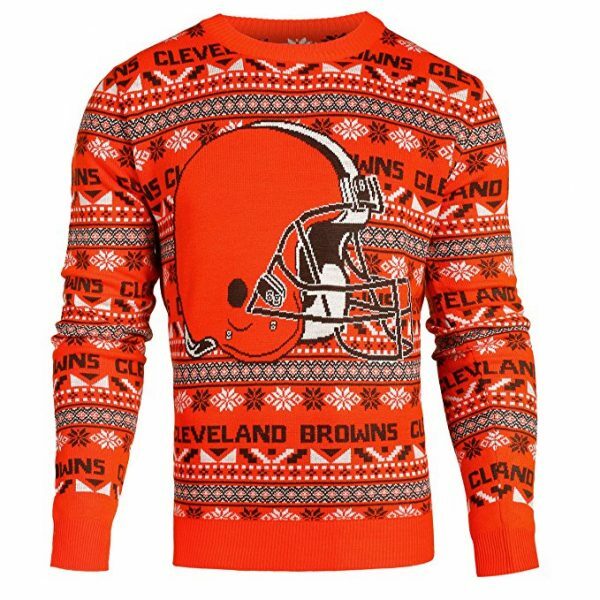 One thing I have to say about this ugly christmas sweater: It reminds me of the sun burning something. Probably not very winter-ish. 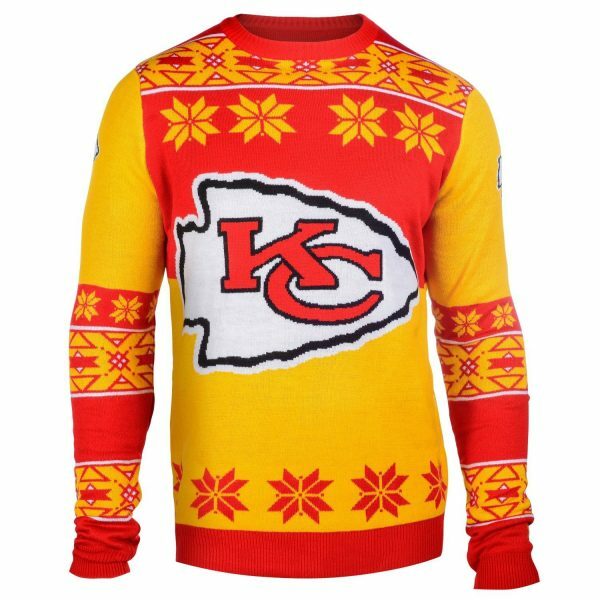 To buy the Kansas City Chiefs sunny Christmas sweater. 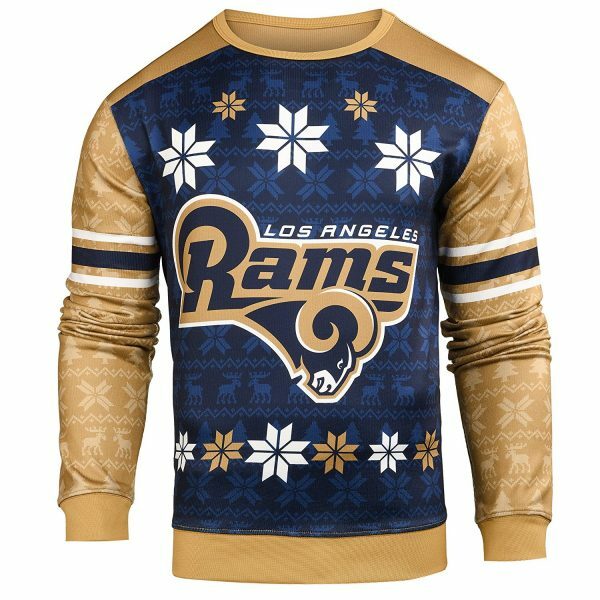 If anyone in Los Angeles actually wears a sweater for Christmas, these golden Rams designs will do the trick. 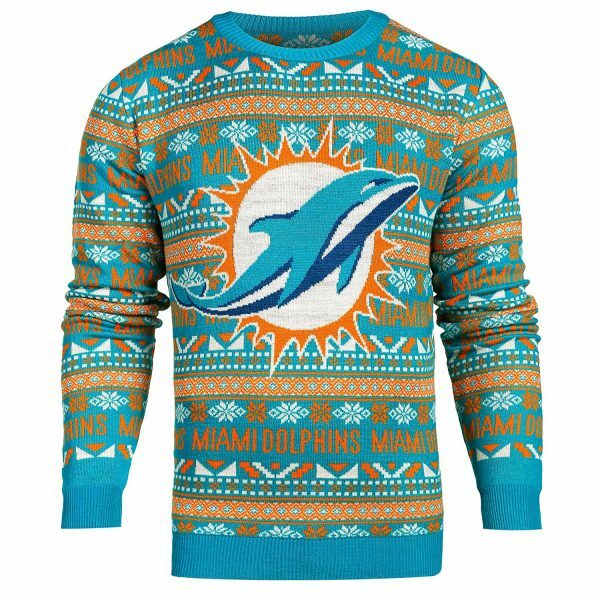 The Miami Dolphins ugly Christmas sweater is really painful to look at, which makes it perfect for the holidays. Who knows? 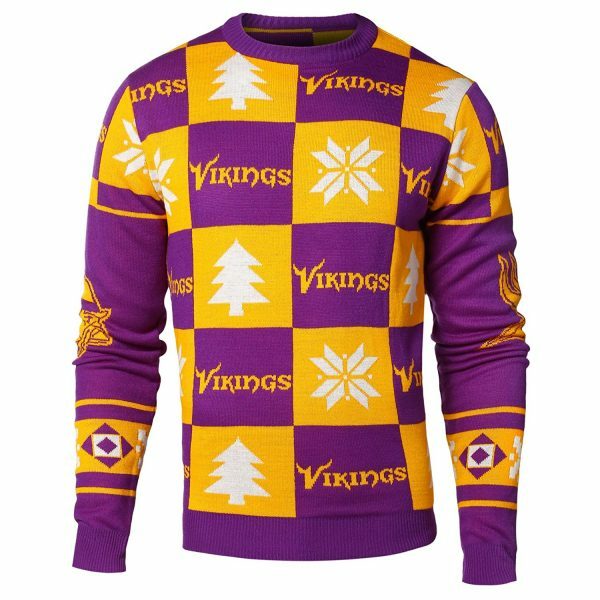 Maybe the Vikings will still be the best team in the NFL when it’s time to put this sweater on for Christmas dinner. 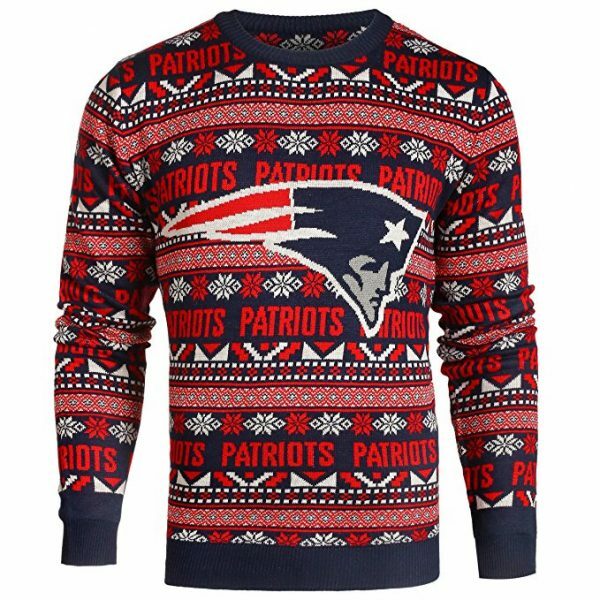 If you wanna wear a Sweater that makes you feel better than everyone and also think they hate you for it, put on the New England Patriots ugly Christmas Sweater. 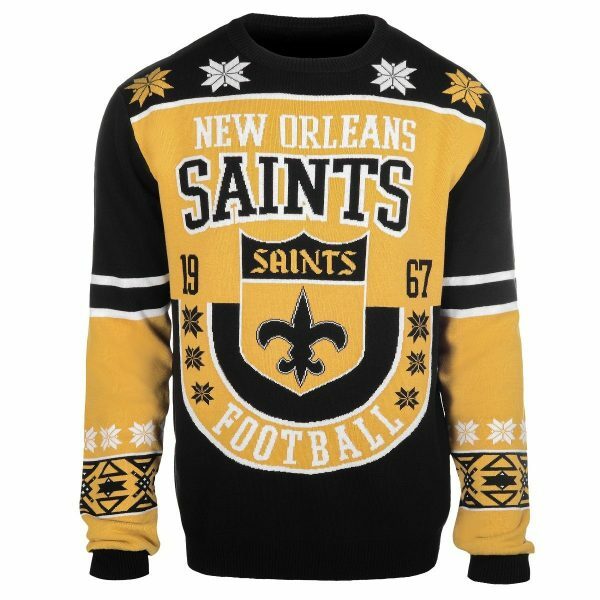 The retro look, making it look more like some distinguished academy and not an NFL team, makes this sweater almost better than all the rest. 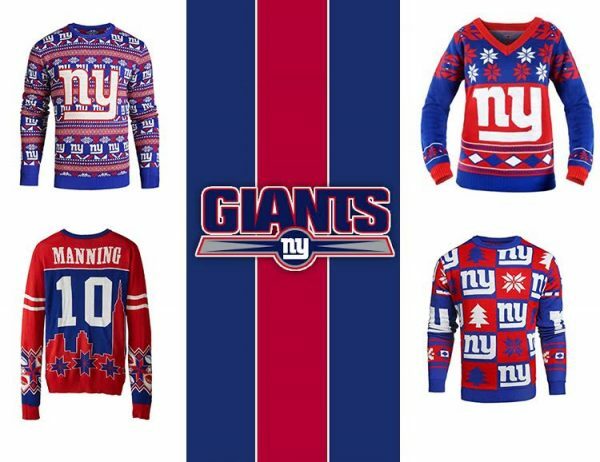 The 3D look makes it seem like one huge video game, or perhaps a Spider-Man uniform posing as a New York Giants fan. 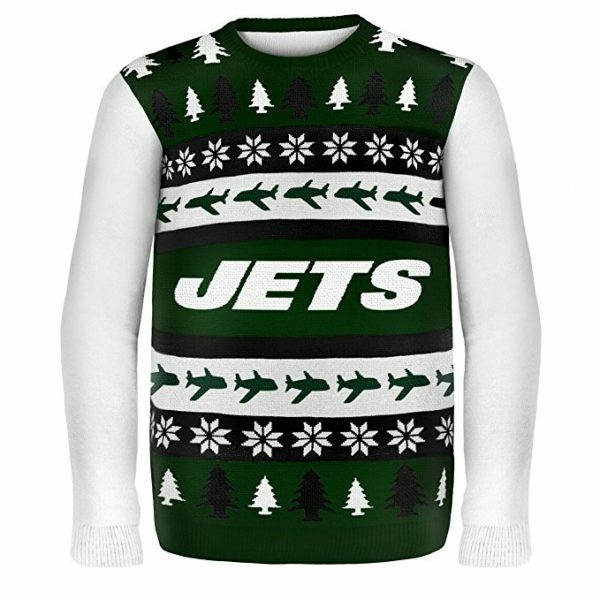 THE christmas sweater to put on if you wanna feel like a head coach of the New York Jets, which is the first thing that popped in my mind when looking at this gorgeous creation. 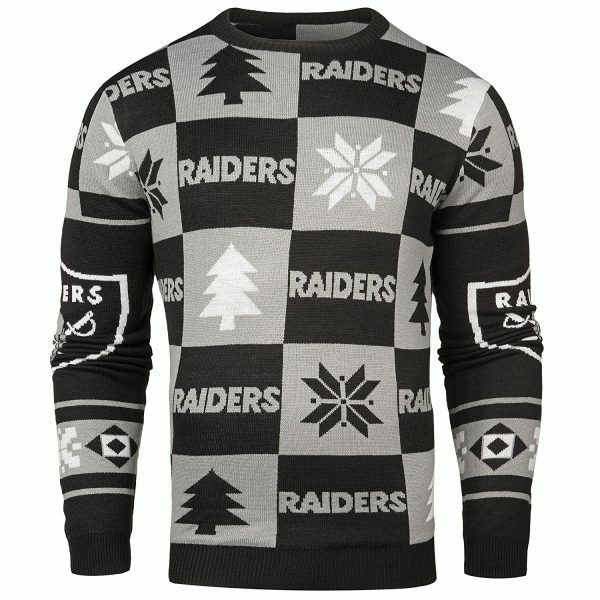 For those who don’t know, the colors didn’t wash out of this sweater: This is how the Oakland Raiders look. To buy their ugly Christmas sweater. By Christmas, this whole funk Carson Wentz and the Eagles are in might be gone. Available on Amazon. 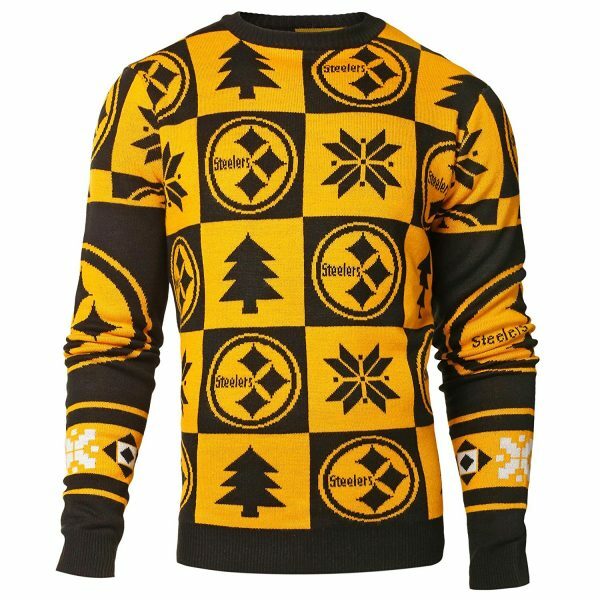 The Pittsburgh Steelers ugly christmas sweater goes along wonderfully with a terrible towel. This sweater reminds me of some old 1980’s video game; maybe Karateka? Buy it (the sweater, not the game) on Amazon. 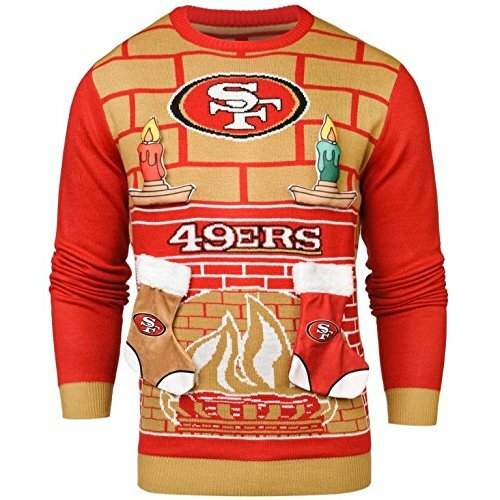 The 3D version of the ugly Christmas Sweater is wonderfully terrible, just like the 49ers have been for almost two seasons. 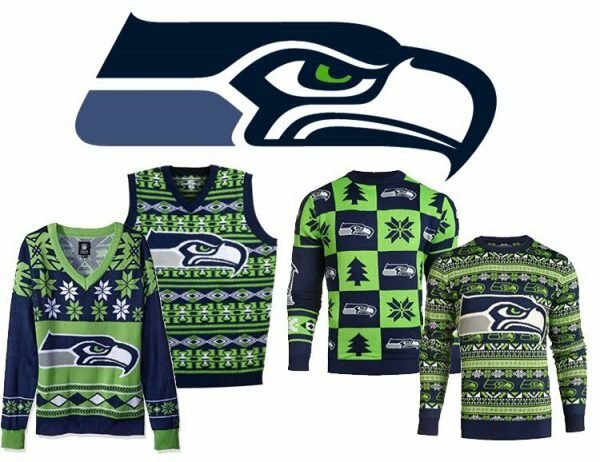 The best thing about wearing a Seattle Seahawks ugly Christmas sweater in 2016 is that no one is going to call you a bandwagon fan anymore. The Seahawks are still very good, but people have moved on to hating on other teams. 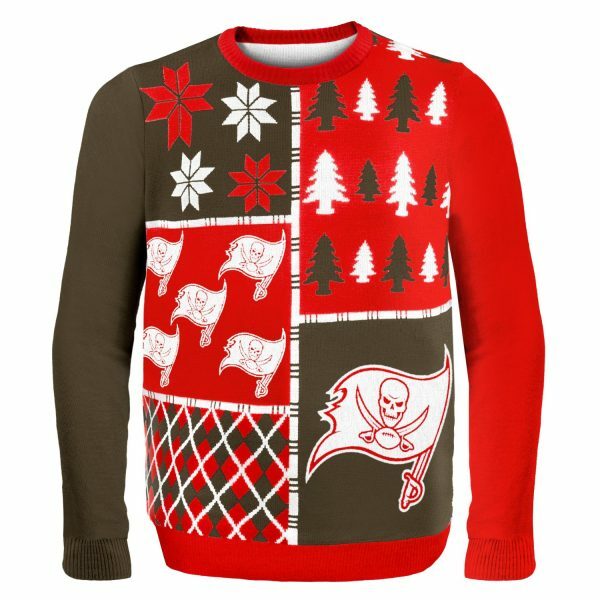 Tampa might be the least Christmassy place in the United States, but I hear people there celebrate the holiday too, so they deserve a cool, ugly sweater. 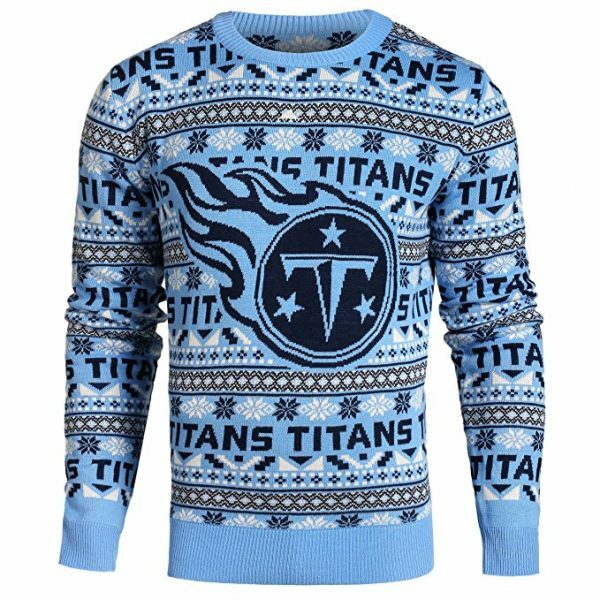 Flames melt ice, but the Titans deserve an ugly christmas sweater just like the rest of the NFL. 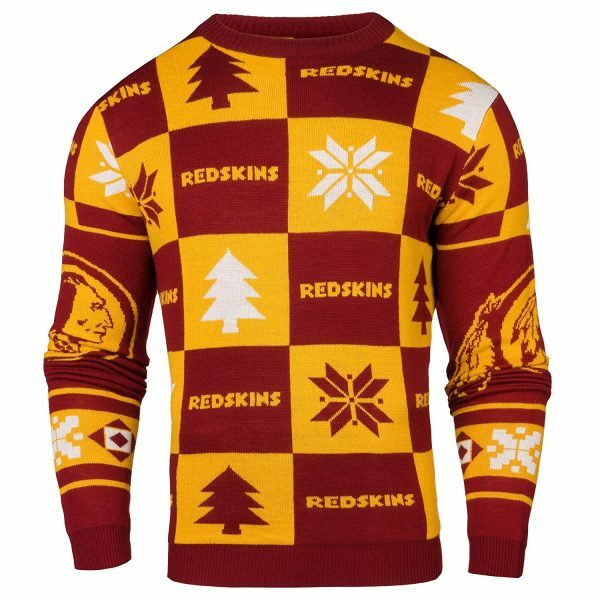 The patches design is always the most popular on Christmas, and this Christmas Sweater might become something of a collectible, considering how the team might not forever be called the Redskins.